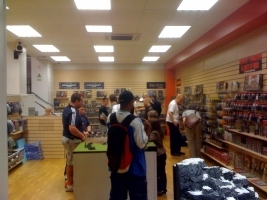 A little while ago, I wrote of my discovery that a new games shop, Wargames Heaven, was opening in Brighton. Well it ending up opening last Saturday. I got there fairly late on, and managed to have a bit of a chat with Guy, the owner of the shop. I also got to take a few pictures. At the moment, there doesn’t appear to be a huge range of stock in, and most of what stock is present is wargames related. But it’s probably a good move to keep stock levels low initially and then see what people want (rather than tie up lots of capital on things that might not sell). I ended up buying the 1st World War Famous Aces version of Wings of War, together with two models – a Fokker Triplane and a Sopwith Snipe. It’s not yet fitted out, but the area above the main shop is going to be a coffee shop, where gamers attending the club (and parents of gamers attending the club) can get refreshments. From what I could see, it looked like a pretty good “full cafe” set up, rather than the traditional fridge plus snacks arrangement you get in lots of games shops. 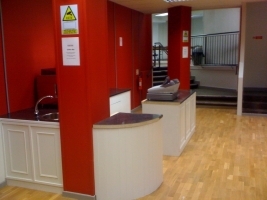 There’s also customer toilets in that area too, which is pretty nice. And then beyond the coffee shop is a third level, which will be the games club room. This will be open all day (including evenings) on weekdays, and then during the day on Saturday and Sunday. From the first week onwards it will only be open to members of the “Valhalla Club”. (I didn’t get any details of that). It’s pretty big. 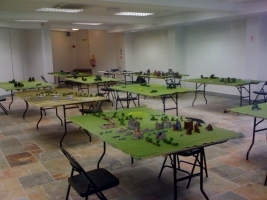 When I was there, it was set up with various wargaming displays, but I’m guessing that once it gets going there will be plain tables for people to play board games or RPGs. My God! It’s Full of Cakes! It’ll be interesting to see how long it survives. All that space can’t be cheap. Hi Jonny, it’s Mathew_Freeman from ENWorld here, just adding in some more detail to this post. The cafe is now stocking both cakes and hot drinks, with new chairs and tables to follow, and Guy has set out some more details of the club. Club membership is £5 for “part-membership” which means you have to pay £1 a time to use the Club Room, or £25 for a years membership that enables you to use it as much as you like. 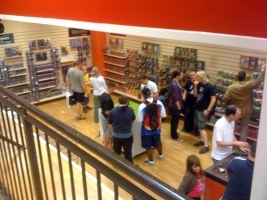 I’ve got a full years membership, and I’m heading down to the store tonight for the first night of a Blood Bowl league, and from talking to people on WWD&DGD on Satuday (where were you? :)) I reckon there is room for some D&D 4e (or 3e, or whatever other RPG) games to be going on. Great place, and very friendly staff. Long may it live. Hi Mathew, cafe sounds good. I’m afraid I couldn’t make it because of previous personal commitment that took me out of town for the weekend. Which is a shame, because I would have loved to be there. I’m probably not up for a regular gaming session as I don’t tend to get back from work (in London) until quite late and I already have one weekly gaming session via Skype. But I’d be up for some irregular games, perhaps board games or things like Wings of War.